If you’ve been playing with CNN’s it is common to encounter a summary of parameters as seen in the above image. We all know it is easy to calculate the activation size, considering it’s merely the product of width, height and the number of channels in that layer. For example, as shown in the above image from coursera, the input layer’s shape is (32, 32, 3), the activation size of that layer is 32 * 32 * 3 = 3072. The same holds good if you want to calculate the activation shape of any other layer. Say, we want to calculate the activation size for CONV2. All we have to do is just multiply (10,10,16) , i.e 10*10*16 = 1600, and you’re a done calculating the activation size. However, what sometimes may get tricky, is the approach to calculate the number of parameters on a given layer. With that said, here are some simple ideas to keep in my mind to do the same. Let me ask you this question : How does a CNN learn? This goes back to the idea of understanding what we are doing with a convolution neural net, which is basically trying to learn the values of filter(s) using backprop. In other words, if a layer has weight matrices, that is a “learnable” layer. Basically, the number of parameters in a given layer is the count of “learnable” (assuming such a word exists) elements for a filter aka parameters for the filter for that layer. Say suppose you have 5, 3*3 filters in a layer, how many parameters can you learn in that layer? You have 3*3 parameters for each filter and you have 5 such filters. Thus, total parameters you could learn would be 3*3*5 = 45 parameters for that entire layer. Now that you know what “parameters” are, let’s dive into calculating the number of parameters in the sample image we saw above. But, I’d want to include that image again here to avoid your scrolling effort and time. Input layer: Input layer has nothing to learn, at it’s core, what it does is just provide the input image’s shape. So no learnable parameters here. Thus number of parameters = 0. CONV layer: This is where CNN learns, so certainly we’ll have weight matrices. To calculate the learnable parameters here, all we have to do is just multiply the by the shape of width m, height n and account for all such filters k. Don’t forget the bias term for each of the filter. Number of parameters in a CONV layer would be : ((m * n)+1)*k), added 1 because of the bias term for each filter. The same expression can be written as follows: ((shape of width*shape of height+1)*number of filters). POOL layer: This has got no learnable parameters because all it does is calculate a specific number, no backprop involved! Thus number of parameters = 0. Fully Connected Layer (FC): This certainly has learnable parameters, matter of fact, in comparison to the other layers, this category of layers has the highest number of parameters, why? because, every neuron is connected to every other neuron! So, how to calculate the number of parameters here? You probably know, take the product of the number of neurons on the previous layer and the number of neurons in the current layer. Thus number of parameters here : ((current layer n*previous layer n)+1). As always, do not forget the bias term! Now let’s follow these pointers and calculate the number of parameters, shall we? Remember the drill? We don’t want to scroll, do we? The first row input has no parameters. You know why. The second CONV1(filter shape =5*5, stride=1) layer has how many parameters? Let’s do the math according to the formula: it is ((shape of width of filter*shape of height filter+1)*number of filters) = (((5*5)+1)*8) = 208. The third POOL1 layer has no parameters. You know why. The fourth CONV2(filter shape =5*5, stride=1) layer has how many parameters? Let’s do the math according to the formula: it is ((shape of width of filter*shape of height filter+1)*number of filters) = (((5*5)+1)*16) = 416. 5. The fifth POOL2 layer has no parameters. You know why. 6. The Sixth FC3 layer has ((current layer n*previous layer n)+1) parameters = 120*400+1 = 48,001. 7. The Seventh FC4 layer has ((current layer n*previous layer n)+1) parameters = 84*120+1 = 10,081. 8. The Eighth Softmax layer has ((current layer n*previous layer n)+1) parameters = 10*84+1 = 841. FYI: I’ve used the term “layer” very loosely to explain the separation. Ideally, CONV + Pooling is termed as a layer. 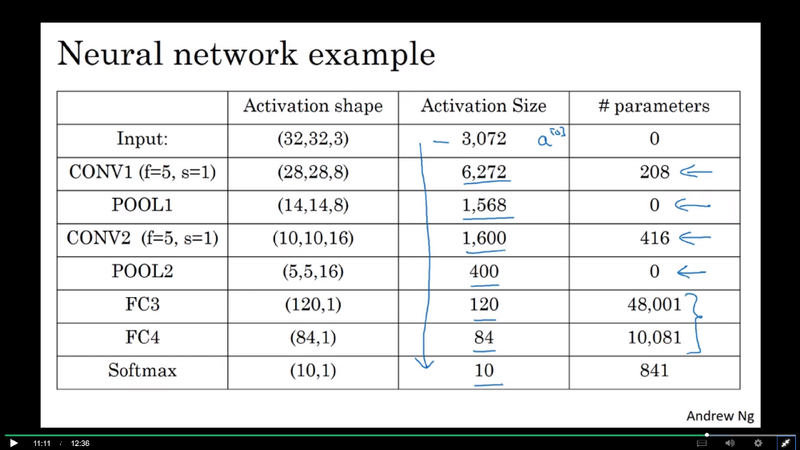 In this article we saw what a parameter in CNN means, we saw how to calculate the activation size, also we understood how to calculate the number of parameters in a CNN. 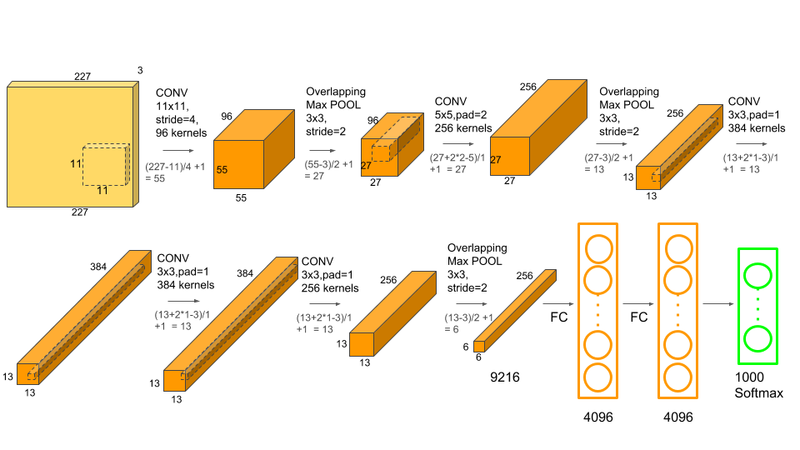 How to calculate the number of parameters for convolutional neural network? If you liked this article, then clap it up! :) Maybe a follow? Next Post:Where is statistics used in data science?